Combining the latest technology and know-how in the storage world since 1998 - Big Yellow Self Storage offers 87 brilliant storage facilities across London and the rest of the UK. For the home and businesses too - this is the solution to all your storage problems. What is usually a tiresome and expensive process is now made easy, plus you can rely on the Big Yellow Self Storage price promise to ensure that you will always get the best deal. There is a room for all here, from value rooms which cost a little less than the standard room should you not mind an irregular shape, to multi-site storage for your big business needs. From opening your storage space to receiving deliveries or making changes to your reservations - the team will always be onsite to help you out every step of the way. It's easy to get a quote online and storing your goods will be even more of a breeze! How do I use my Big Yellow Storage promo code? Click yes on 'Got a promotional code' and paste in your discount code if necessary, otherwise, your discounts will be automatically applied at the checkout. Thinking of hiring a van for the big move? 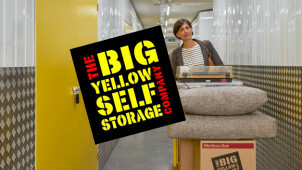 No need to worry about the cost of getting your goods into storage as Big Yellow Self Storage will refund you £50 of the price! Do check the Terms and Conditions. Where is my nearest Big Yellow Self Storage company? You can use your Town name or postcode to find your closest storage centre here. Does Big Yellow Storage offer NHS or armed forces discount? Yes, there is a 10% discount for members of the NHS as well as for those in the Police, Ambulance, Fire service or Armed Forces. You will need to produce a valid ID card and do check the Terms and Conditions which apply. Customers will need to pay a security deposit before using the storage facilities, this is refundable and depends on the room size you choose. Am I able to insure my goods? This is possible, insurance starts at £3.25 per week, and the average customer tends to take out insurance cover at £6 a week. Get in touch to find out your personal quote on 0800 783 4949 or 01276 477177. You can also reach Big Yellow Storage via their contact form online. Do you know about the nation's favourite self-storage company? With convenient locations, top quality facilities and everything you need to keep peace of mind when storing your goods - individuals and businesses alike are benefiting from the excellent service that Big Yellow Self Storage provides. Use a Big Yellow Storage promo code today and discover a new solution to your storage problems. Offering a unique and bespoke service to cater specifically for your needs - this is a company that you can trust. Big Yellow Self Storage is fully committed to maintaining the environment around us. Understanding the important role it plays, it continues to strive towards an environmentally friendly business. Hoping to reduce its carbon emissions by 10% and using renewable energy sources for 20% of the company's usage. These guys are recognised by The Sunday Times and FTSE4Good as a green and overall great company! If you like a tipple or two like us then you may also need some extra room for your wine selection! With 500 private, climate-controlled wine cellars - you can access your stash, 7 days a week. Big Yellow Storage guarantees security, flexibility and impeccable customer service at a great price with a Big Yellow Storage discount code from us. With wine tasting rooms too, this is the perfect solution for all wine enthusiasts. Whether you need temporary storage for a big event like a wedding, for a very generous inheritance or as an overflow for your bar or restaurant - Big Yellow has the solution.